Join us at the NE Public Library Branch located at 5513 Thomasville Rd for our next event. Based on interviews with Jerrie Mock, source documents and excerpts from Jerrie's book, "Three-Eight Charlie", Taylor shares with us the now almost forgotten race to become the the first woman to fly solo around the world. One of the more remarkable things about living in Tallahassee is discovering the stories of those who shared a similar love for this area. Sometimes the simple home next door is the residence of a person who lived a life of adventure or has a unique story to tell and unless you ask, the story will often become lost amongst the noise of our present society. One such home and one such tale lies just a few miles west of Tallahassee in the small community of Quincy, FL. There a woman named Geraldine “Jerrie” Mock quietly passed on September 30, 2014 and without the efforts of historians and writers like Taylor Phillips, a chapter of aviation history might have quietly passed with her. Almost everyone has heard of Amelia Earhart, an aviatrix tragically lost during an attempt to circle the globe in a small plane during 1937, but few know the name of Jerrie Mock. Jerrie earned her pilot’s license in 1958 and by 1960, she was one of only 12 , 471 licensed female pilots in the United States. 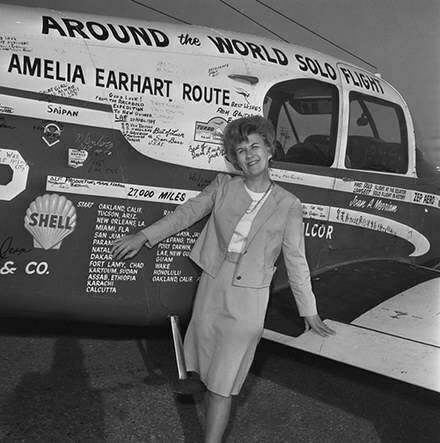 Two years later in 1962, she answered the internal call for an for an adventure when she realized that even 25 years after Amelia’s death, no woman had circumnavigated the world solo in an airplane. 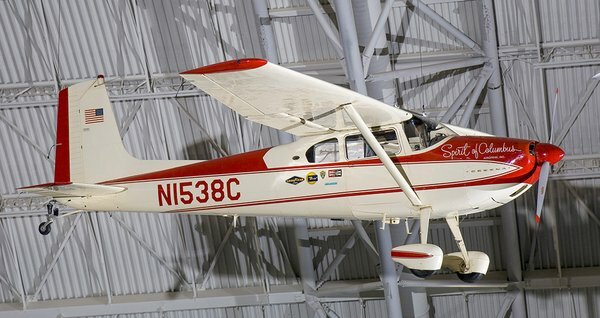 As the part-owner of a Cessna 180 four-seat aircraft, Jerrie began planning for what would become the greatest story of her life. On the morning of March 19, 1964, she sat in the cockpit of the modified plane checking last minute details befor e take-off. She would be undertaking the flight two weeks earlier than originally planned and completing the necessary modifications to the eleven year-old plane had turned into a last-minute scramble. Just two days before a fellow aviatrix named Joan Merriam Smith had taken off from an airport near San Francisco, CA in an attempt to retrace the unfinished flight of her inspiration, Amelia Earhart. Flying a much faster airplane and flying solo like Jerrie, a sort of “race” developed in the news coverage of both women as they each attempted to overcome the incredible physical hardships of flying over 23,000 miles during their journeys. Local author, Taylor Phillips, learned that Jerrie Mock lived nearby and had the opportunity to speak with her extensivley before her death in 2014. From these shared moments and materials provided by Jerrie, the story of the nearly forgotten race took shape leading to his most recent book, "Racing to Greet the Sun: Jerrie Mock and Joan Merriam Smith Duel to Become the First Woman to Fly Solo Around the World" available on Amazon.